In the two sketches of Mongoose Lake in Museum London’s permanent collection, MacDonald reveals active and rapid brushwork; the desire to “freeze” the vivid colours of the Algoma woods and hills is more important than capturing minute detail. When moving from sketches to canvas, MacDonald retained the dazzling colour in his Algoma paintings but controlled his brush, using decorative swirls and short strokes more reminiscent of Vincent van Gogh and Paul Cézanne. If MacDonald’s technique, like those of his fellow Group of Seven painters, showed influence of European styles, it was, in his mind, used to an entirely different end. 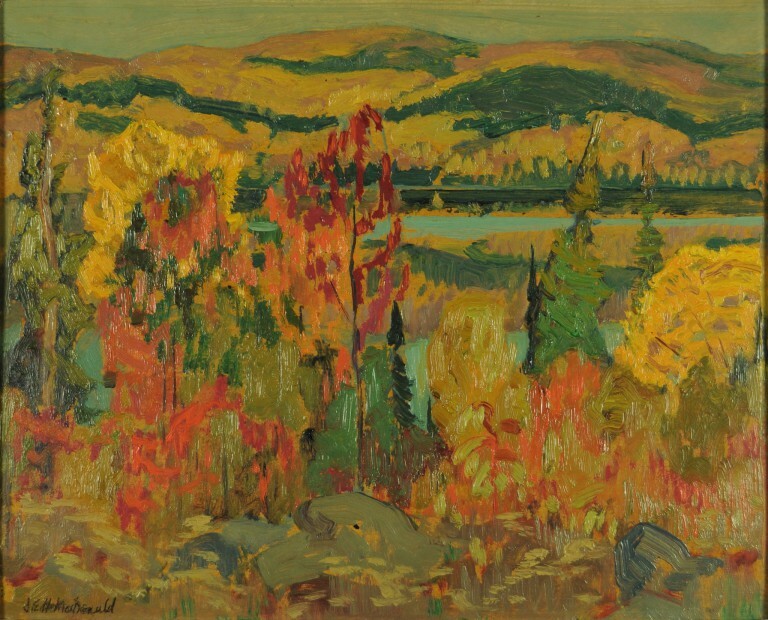 MacDonald shared the belief that the “development of a living Canadian art”2 was only possible if artists fully committed themselves to the challenge of expressing the uniqueness of their environment. That meant discovering, as Harris wrote, “that there were cloud formations and rhythms peculiar to different parts of the country and to different seasons of the year.”3 And it meant MacDonald experiencing “something of the feeling of the early explorers” as he tried to “paint the soul of things”4 in the magnificent landscape of Algoma. 1. A Painter’s Country: The Autobiography of A.Y. Jackson (Toronto: Clarke, Irwin), 1958. 2. quoted in Anne Newlands, Canadian Paintings, Prints and Drawings (Richmond Hill, ON: Firefly Books, 2007), 194. 3. quoted in David Silcox, The Group of Seven and Tom Thomson (Toronto: Firefly Books, 2003), 300. 4. quoted in Anne Newlands, 194.